From 21 to 23 June 2011, a big conference was held at the American University of Sharjah (AUS) in the UAE, jointly organised by the British Council (BC) in partnership with AUS and in association with the International Society for Science and Religion (ISSR). The conference forms part of the British Council’s “Belief in Dialogue” initiative, which is intended to foster closer inter-faith dialogue on matters of common cultural interest, including religious belief and the place and significance of the sciences in various worldviews. Science and Religion: Two Cultures? Ethical Values and Human Responsibility. This theme will explore ethical issues in relation to the environment, to questions of sustainability and to problems arising from new technologies – including such controversial matters as stem-cell research. Over 40 of the world’s leading thinkers from across 10 countries have convened at AUS for the conference, including HE Ekmeleddin İhsanoğlu, the Turkish scholar who is currently the Secretary-General of the Organisation of the Islamic Conference (OIC), who gave the opening keynote speech, Tariq Ramadan, the well-known scholar of Islam and Philosophy, and many others from around the world. A list of plenary speakers also included Paul Davies, Ziauddin Sardar, Munawar Anees, Andrew Briggs, John Hedley Brooke, Philip Clayton, William Grassie, Nidhal Guessoum, Salman Hameed, Aref Nayed, Jean Staune, Mehdi Golshani, and Ronald Numbers. His Excellency Professor Ekmeleddin Ihsanoglu, Secretary General of the Organisation of the Islamic Conference (OIC), called on Islamic countries to reform the higher education sector and increase their focus on science and technology, at the opening ceremony of the Middle East’s first Belief in Dialogue: ‘Science, Culture and Modernity’ conference, organised by the British Council in conjunction with American University of Sharjah (AUS) and held under the patronage of Highness Sheikh Dr. Sultan Bin Mohammad Al Qassimi, Supreme Council Member, Ruler of Sharjah and Founder and President of AUS. From the opening plenary session: From left to right – Nidhal Guessoum, Paul Davies, Mark Rush and John Hedley Brooke. Professor Ihsanoglu urged member-states of the OIC-an inter-governmental organization comprising 57 states- to commit to becoming a community that values knowledge and is competent in advancing science and technology to enhance the socio-economic well-being of the Muslim world. “With the advent of the 21st century, the position of Islam towards science has developed more in the direction of achieving advance knowledge and know-how in a rather pragmatic way. 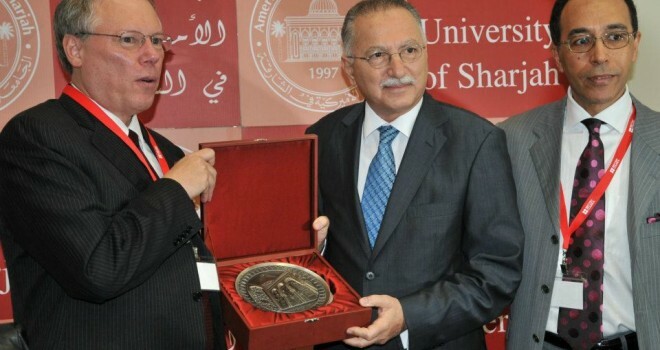 The importance of scientific enterprise became more prominent and the need for excellence in research is felt in more advanced Muslim countries,” said Professor Ihsanoglu. Professor Ihsanoglu personally proposed that the leading countries of the OIC should reach 1% of their expenditure of GDP on research and development. As a result of the OIC’s efforts, average expenditure on research and development among member states has recently doubled -growing from 0.2% of GDP in 2005 to 0.41% of GDP today. Professor Ihsanoglu’s speech opened the ‘Science, Culture and Modernity’ conference, organised as part of the by the British Council’s global Belief in Dialogue programme that explores how people all over the world can live peacefully amidst growing diversity. He travelled to Sharjah immediately from an official visit to the U.K. where he had held meetings with Prime Minister David Cameron, and Foreign Secretary William Hague. Dr. Peter Heath, Chancellor of American University of Sharjah, speaking at the opening ceremony said, “It is fitting that this conference on ‘Belief in Dialogue: Science, Culture and Modernity’ be held at AUS not only because it concurs with our university’s vision and mission, but also because there are few universities in the world where one encounters such social, national, and religious diversity. The 5,250 students of this university represent over 80 nationalities; its faculty and staff comprise over 40 nationalities. AUS is coeducational, with its student body almost equally divided between women and men. “It is an essential part of the mission of AUS, as with any great university, to offer opportunities for its own community and for members of the general public to consider, discuss, and investigate the great issues of the day,” he added. A debate hosted by the BBC World Service on Wednesday, June 22nd is set to be a conference highlight and will invite a global audience to participate in the spirited exchange that will take place over the course of the event. Dr. Mark Rush, Dean of the College of Arts and Sciences at AUS, said AUS and the UAE, provide an ideal venue to discuss themes of science, culture, and modernity. “This region is also the epicentre of a civilization that stretched from the Atlantic to India. One of the shining lights of the civilization was the culture of Al Andalus which boasted an intimate, intense, and peaceful intermingling of cultures and philosophies that gave rise to astonishing advances in science and learning. 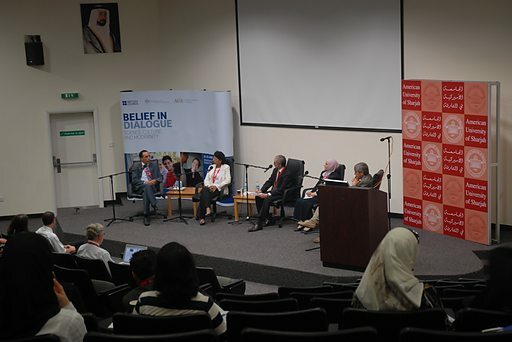 The spirit of common inquiry that characterized Al Andalus brings us together today,” said Dr. Rush. “The themes and issues we will discuss over the next three days all address the intersection of science, religion, ethics, public policy and the extent to which the development and accumulation of more knowledge about these topics will promote common cause amidst diversity or simply fan the flames of disagreement and division,” he added. Over 40 of the world’s leading thinkers from across 10 countries have convened at AUS for the conference, which is part of the British Council’s global Belief in Dialogue programme. The confirmed line-up of speakers at the conference include Patricia Fara: a historian of science at the University of Cambridge; Tariq Ramadan: Swiss Muslim intellectual, philosopher, and writer, currently Professor of Contemporary Islamic Studies at Oxford University; Qanta Ahmed: author and Associate Professor of Medicine at the State University of New York; Ziauddin Sardar: writer and cultural-critic who specializes in the future of Islam, science and cultural relations and Dr. Nidhal Guessoum, Professor of Physics, AUS.